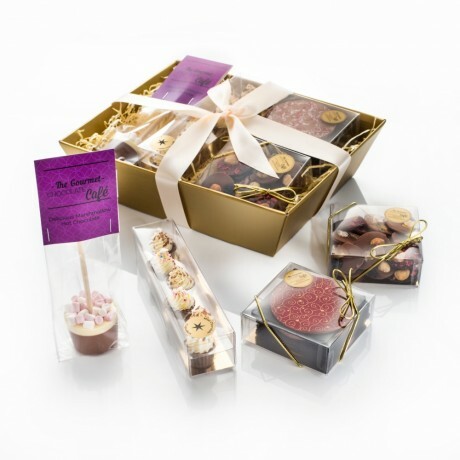 What better gift to recieve for a special occasion than a delicious chocolate hamper? We have combined some of the bestsellers in our Café range to create a lovely Café hamper. The perfect gift for any coffee or hot chocolate lover. Each hamper contains a small pack of Topitoffs (contains 6), a box of Palet Gourmands and a selection of Mini Chocolate Cupcakes, along with one of our indulgent Marshmallow Hot Chocolate Sticks. All beautifully presented in a gold coloured hamper tray with a hand tied ribbon. A box of goodies that's guaranteed to put a smile on anyone's face! This product contains soya, wheat, nuts and milk. Looks absolutely amazing and such an original idea, it makes a change from an egg for Easter. I will definitely use them again and would highly recommend them for quality ,& price. Excellent, very quick and it did fit through the letter box unharmed even though leaving messages in case they rang door bell! Yes, inpressed with service and product. Bought as a gift which they totally loved. Bought as a gift which they totally loved. Thankyou for a great product & great service. I bought this as a birthday present for my chocoholic daughter-in-law. She said it was ‘amazing’ ! I bought this pizza for my daughter as a "thank you" present. I bought this pizza for my daughter as a "thank you" present. She was over the moon! I was allowed a little piece too! We both thought the chocolate was beautiful, tasty but not cloying. Presenting it in a pizza box just adds to the fun of opening it. Needless to say, the pizza didn't last long, but it's left a lasting impression. I ordered this as a gift for one of my friends and had it sent to her house and I have to say that I cannot fault the service! It arrived on time and she absolutely loved it - the personal message was such a lovely touch. She said that it tastes amazing and I will definitely buy again. Excellent product and excellent vendor in every aspect of distance selling. Deliciously decadent and uniquely fun chocolate pizza gifts.